Covenant Health has again been named one of “America’s Best Employers” by Forbes magazine and is the highest-ranking Tennessee organization to receive the designation this year. Only seven Tennessee firms made the list of 500 top large companies. Covenant Health was ranked 38th on the list this year, the health system’s second year to be ranked as one of America’s Best Employers by the national business publication. The 2017 lists include the best large and midsize companies in the U.S.
Companies and organizations in the top 38 along with Covenant Health included such major institutions as Mayo Clinic, MD Anderson Cancer Center, Costco, Facebook, Sandia National Laboratories, Four Seasons Hotel and Resorts, Duke University, Publix, Michelin, Southwest Airlines and NASA. Covenant Health was listed 10th among hospitals and healthcare organizations and is the only East Tennessee healthcare entity selected in 2017. “Covenant Health is proud to receive the Forbes designation for the second year in a row and to be included in such a prestigious list of national and international companies and organizations,” Covenant Health President and CEO Jim VanderSteeg said. “Our employees make a commitment to support our health system’s pledge of excellence, which includes putting our patients first, excellence in everything we do, and making Covenant Health the first and best choice. This commitment creates a workplace environment that instills pride among all of us at Covenant Health. 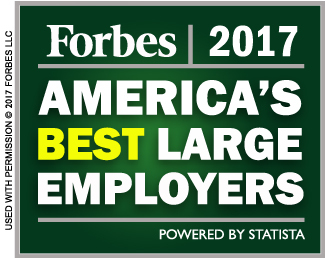 For more information about the Forbes list, visit https://www.forbes.com/best-employers/list.